Join us for FREE, LIVE music on Friday, February 8 featuring Jive for Five! from 6-8PM. Jive for Five! has a repertoire of over 300 tunes which include everything from Bach, the Beatles, Dave Brubeck, Duke Ellington, Gershwin & Miller, Gabrieli, Mozart, Karl King, John Philip Sousa, Fats Waller and Broadway musical scores. 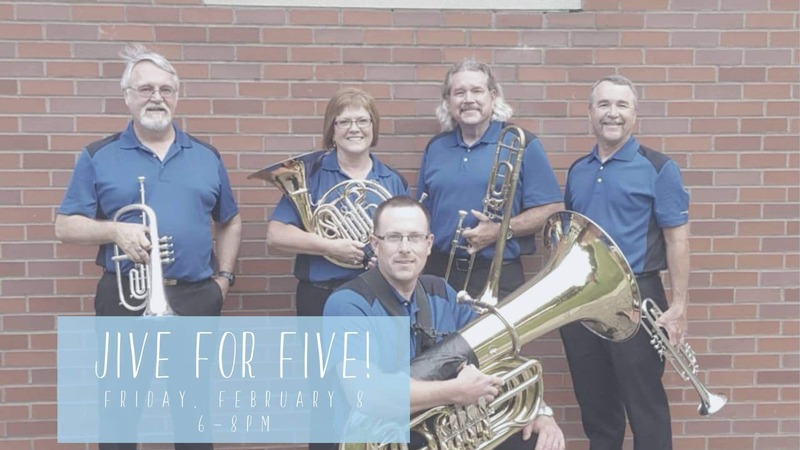 In addition to teaching and performing in Jive for Five!, all five members are busy with other organizations including the Fort Dodge Area Symphony, the nationally renowned Karl King Municipal Band of Fort Dodge, and other top performing groups. The members of Jive for Five! are also in demand as private instructors and clinicians. All maintain active private teaching studios. Sneakers Eatery and Pub will be here with dinner!